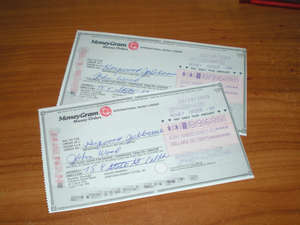 So I received a pair of $896 money orders in the mail. They were to pay for a $165 computer power supply. I'm to send the power supply and the difference, minus an extra fee for my troubles of course, to the scammer's bank account. I'll get right on that... I'm going to email him back and tell him the bank wouldn't cash them, just to waste a bit more of his time. Another scammer wanted me to help him claim an unclaimed bank account at some back, worth $15,000,000. Wow wee, what luck eh? So he asked for my phone number, so I gave him the number to my local police station. He got back to me saying that he tried to call but got a voice mail. Sadly, he probably didn't call at all. So then he sent me a Word document that I was supposed to fill out. It has some personal info on it but nothing too bad. So I made a file that was about the same size at that file, but was pure jibberish. I emailed it back to him as directed, and told him I had added some extra info like bank account numbers and social security numbers, in case he needs them. So this guy is going to freak out, and spend hours trying to open this file that he thinks is the jackpot. I'm also hoping that this scammer is paying by the minute to use computers at an internet cafe.